In Columbus, Ohio, it’s J.T. Barrett’s world — the rest of us just live in it. I’ve been a fan of Ohio State football for decades, and during that time there have been many popular players — Archie Griffin, Chris Spielman, Eddie George, and Troy Smith among them — but I can’t remember a player who was as much of a phenomenon as J.T. Barrett. When Braxton Miller went down with an injury only days before the season began, Barrett was a virtual unknown who had to fill the shoes of a Heisman Trophy favorite. He responded with one of the greatest seasons in Buckeye history, smashing many of offensive records in the Ohio State record book and leading the team back into contention for the national title after an early season stumble against Virginia Tech. And then, after improbably putting himself in contention for the Heisman Trophy and leading Ohio State to the brink of over arch-rival Michigan, Barrett suffered a gruesome injury that ended his season. He reacted with class and stoicism — as every J.T. Barrett fan knew he would. Throughout the season, he has managed to combine humility, quiet confidence, and leadership in a heroic mixture that seems more suited to a Grantland Rice story than modern reality. But when he broke his ankle, then gave the stunned crowd a sign as he was carted off the field, then showed up in the stands in an inflatable cast so he could help root his team to the win, Barrett became the stuff of legend. If you don’t live in a college town, you may not fully appreciate the depth of admiration Ohio State fans feel for J.T. Barrett. We’re sad his wonderful season ended so brutally, but we’re so proud of how he has handled himself even in the face of this adversity. There are little boys in Ohio now who want nothing more than to grow up to be like J.T. Barrett, and their parents are happy their sons have picked such a terrific role model. 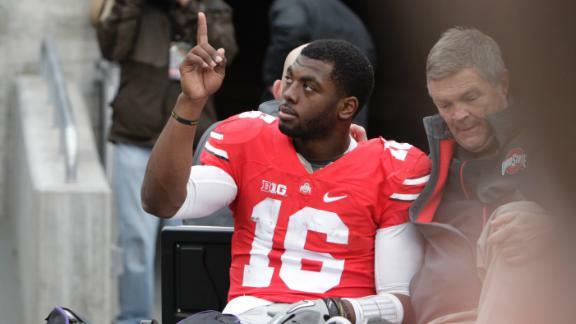 No member of Buckeye Nation who lived through this season will ever forget the story of J.T. Barrett.